A major car dealership has revved up its telephone system after appointing Worcestershire company Armstrong Bell to overhaul its telecommunications systems to cope with increasing demand. The new system is so much better than our old one. Calls used to be transferred and left ringing on an extension but now it goes straight through to the first available operator. 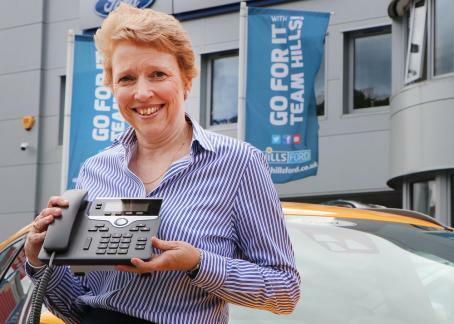 Hills Ford, a family-owned dealership that has two Ford sites in Kidderminster and Malvern, asked Armstrong Bell to undertake a wholesale revision of its telephone system because its two old BT telephone systems were no longer fit for purpose. The Bromsgrove-based telecommunications specialist worked closely with Hills Ford, which also runs Brookhire car and van rental in Malvern as well as Hills self-storage from its Kidderminster base, to create a bespoke, connected system that could cope with the volume of calls going to all three sites. Armstrong Bell installed more modern and efficient cabling throughout to ensure the business had maximum flexibility and seamless connectivity, a SIP-hosted telephony system with reporting system that automatically upgrades its software and provides call-forwarding and out-of-hours messages, headsets for staff at Brookhire as well as 60 handsets. Catherine said: “The new system is so much better than our old one. Calls used to be transferred and left ringing on an extension but now it goes straight through to the first available operator. This improvement alone enables to provide better customer service because we can make sure people get through to the right person and team. “We were nervous about changing the telephones because a few months before we’d changed our document management software for invoicing and sales, which caused considerable disruption. But thankfully our concerns this time were not realised because the transition was smooth and efficient. William Copley, managing director of Armstrong Bell, said: “The beauty of having a hosted system is that it is constantly updated with latest software and so there is very little on-site maintenance. We were able to use our expertise in complex communications systems to ensure that Hills Ford had the most efficient telephone system in place for its needs, ensuring that no calls would be left unanswered. For further information call Armstrong Bell on 01527 834850 or email . Fill in this form and one of our team will be in touch to help you out the next working day.